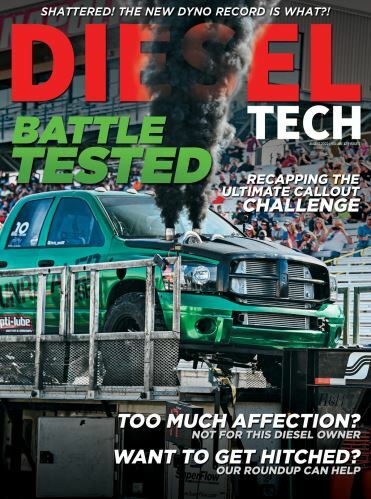 At Diesel Tech, we’re constantly pulling trailers—big trailers, small trailers and everything in between. So we’re constantly trying to chase down the right receiver to match the trailer mount size. Over time, many of these receivers start to rust. And some are two low, some two high. There are just a bunch of reasons why it’s nice to find a receiver that is versatile, well-designed and looks great on the back of our truck. We came across the FastWay Flash E series aluminum ball mount tow hitch and wanted to take a closer look at some of its attributes—like a six-inch drop for adjustability and a two-size ball holder that allows us to keep the most common two trailer balls with the receiver. This way you always have the correct ball size and can adjust your receiver to the proper height for your trailer. The chrome finish is attractive and doesn’t look cluttered like so many other receivers. It has a 1,000-pound tongue capacity. We also got the Flash E series dual lock pack that ensures our receiver stays connected to our truck at all times. The key lock is easy to use. It’s not spring-loaded. You can turn the lock and it will release from the pin. When you put it back on, you turn the lock to secure it to the pin. The Flash E series mount retails for $199.95. The Dual Lock Pack retails for $39.95. Contact www.fastwaytrailer.com.